BENEDICTINES are men and women who live according to the Rule of St Benedict. The Rule is ancient – now nearly 1500 years old – but full of spiritual wisdom and practical guidance. 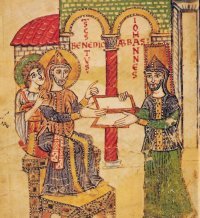 Historically, Benedictines have undertaken many particular works in the life of the Church. In some countries they run schools and parishes, in others the monasteries have been mission centres for primary evangelisation, or seminaries for the training of priests, but Kristo Buase Monastery is a ‘contemplative’ community, which means that our primary function is prayer. We aim to support ourselves financially by our manual labour, but our only apostolic work lies in the reception of guests. Our day is spent in the balanced alternation of three elements: prayer, work and study, within the framework of a stable religious community. PRAYER for St Benedict means primarily the ‘Work of God’, the solemn recitation of the Liturgy of the Hours. Monks have as their basic prayer book the one hundred and fifty Psalms of David found in the Bible. These, together with hymns, readings from Scripture, prayers and intercessions form the core of our public prayer. The psalms are so arranged that the monk sings his way through the entire psalter once every week. In all we spend about three and a half hours a day together in church at regular intervals throughout the day. Obviously liturgical prayer alone would soon become dry and lifeless. A monk needs also a more personal encounter with the Lord through silent prayer. There is a period of about thirty minutes of prayer in common before the Blessed Sacrament each evening, but the intention of our way of life is that prayer should spill over into everything we do. That is why we have a general rule of silence: it fosters recollection and an awareness of the presence of God at all times and in all places. Monks have their own distinctive form of prayer, known as Lectio Divina. This is a slow and meditative reading of the Scriptures, or the writings of the Fathers, as a way to “chew over” their meaning, extract more of their richness, and lead us on to prayer. Often it consists of no more than a word or a phrase repeated over and over to oneself in silence. WORK has always played an important part in the monastic day. St Benedict says in his Rule, “They are truly monks when they live by the labour of their hands”, and that “Idleness is the enemy of the soul” (RB 48). Manual work has been the lot of man ever since the time of Adam. It may at times seem like a burden – something perhaps we would prefer not to do – but monks throughout the ages have discovered that it is necessary for the health of both body and soul. 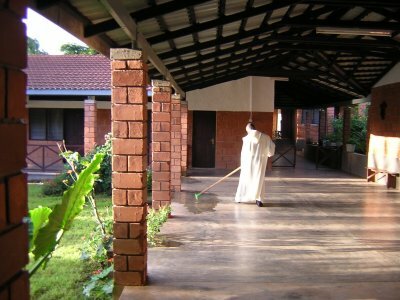 In a modern Benedictine monastery work also has an essential role in the financial support of the community. Through a simple lifestyle, close to nature, the monk seeks to live in harmony with God’s creation. 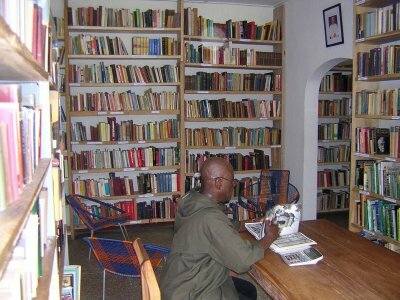 There is also a monastic tradition of STUDY and scholarship and the community has a well-stocked library of more than 7,000 books. The main subject areas are Scripture, Philosophy, Theology, Liturgy, Monastic Spirituality, Sufi-Islam and African Studies. The timetable of a typical day is: Rise: 0430; Vigils: 0445; Morning Prayer: 0600; Mass: 0645; Breakfast: 0730 Mid-Morning Prayer: 0810; Followed by 3 hours of manual work or studies. Midday Prayer: 1230; Dinner: 1245; Followed by Siesta. Afternoon Prayer: 1445, followed by Manual Work or Studies. Evening Prayer: 1730, followed by time for silent prayer. Supper: 1830; Compline: 1945; Retire to Bed: 2030. Sunday Mass is at 0930 and open to all. 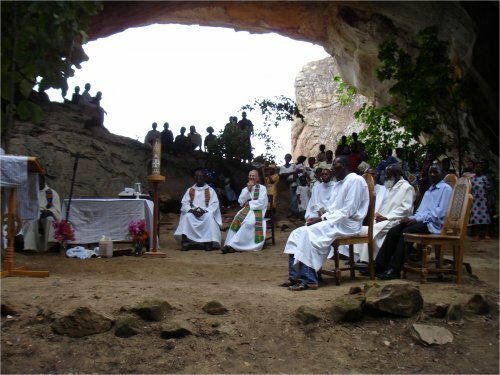 The third Sunday of the month is set aside for the local Dagaaba community with northern music and translations into Dagaare. The last Sunday of the month is for the Twi-speaking community of Tanoboase. On the remaining Sundays, Mass is in English. If you are interested in becoming a monk at Kristo Buase, click here to go to the Vocations page. For current news of the Kristo Buase Community, click here to go to the Friends page.